The Fourth's a-coming. Surfing the cyberwaves I came across some interesting and entertaining material on photographers' rights. I provide links below along with some excerpts of the content that I hope will entice you to read the entire articles. This is stuff all photographers should know. Now, keep in mind that legal rights are not the same as authority or instrumentality. You may have the legal right to do something but that doesn't mean someone else lacks the capability of bully, coercing or threatening you into stopping. The 98 lb. weaklings might have the law on their side, but that won't stop the 200 lb. thugs from smacking the crap out of them. I applaud anyone who wants to stand up to the bullies, but I don't disparage those who are disinclined to do so. You want to volunteer to take a bullet for the cause? Yer aces in my book. But, I'm morally opposed to conscription. The million-dollar questions are: Is it a violation of law to take photographs at airports? And under whose jurisdiction does the matter fall? "No, it's not against the law," says Anne Davis, a Transportation Security Administration (TSA) spokeswoman. When asked about jurisdiction, Davis describes TSA as the overseer of all airport security matters, including the supervision of local law enforcement. "The buck stops with us," she says, adding that the agency has no specific policy with regard to picture taking, other than asking people not to tape or photograph screening apparatus. Phil Orlandella, the media relations director[:] "Who controls security, TSA or the local police?" he says. "They both do, it's that simple. And no, it's not against any rules to take pictures, inside or outside, period. If anyone tells you otherwise, that's a bunch of baloney." He warns that yes, individuals snooping around with cameras might be approached and questioned, but photography itself is fully within a visitor's rights. "A passenger is free to take any picture he or she wants," he says, "in any public area of the airport, end of story. If you're not deemed a threat, you're free to click away." And yes, you can shoot on private property if it's open to the public. That includes malls, retails stores, Starbucks, banks, and office-building lobbies. If you're asked to stop and refuse, you run the risk of being charged with trespassing, but your pictures are yours. No one can legally take your camera or your memory card without a court order. You can also shoot in subways and at airports. Check your local laws about the subway, but in New York, Washington, and San Francisco it's perfectly legal. Airport security is regulated by the Transportation Security Administration, and it's quite clear: Photography is A-OK at any commercial airport in the U.S. as long as you're in an area open to the public. Is it legal to take photos? A set of Q's, A's, and useful links. What every cameraman, photographer and videographer should know about invasion of privacy standards in the 50 states and D.C.
Have fun, play safe, make trouble, don't blow up anything I wouldn't blow up. The interesting part of the quote is this: "...If you're not deemed a threat...". And just who is it that does the deeming? It won't be the photographer, that's for sure. What people need to understand is that much of what is done in the name of security is there to give the APPEARANCE of security rather then the reality. That appearance of security is intended to dissuade evildoers and to reassure the public that all that can be done is being done. In what proportion those two motives exist is problematic. I have read many accounts of photographers being harassed by officialdom or other members of the public. The stories are invariably anecdotal and it's tempting to dismiss them as isolated incidents. But at some point, a large number of isolated incidents turns into a pattern. I believe that it's probably an occupational hazard of people in authority to boss others around and those situations can quickly turn into "us" vs. "them". Situations like these can escalate rapidly and badly for no good reason. Four people were shot at Kent State not long ago. Some people were shocked and others applauded the shootings. Why do we believe that giving others blind authority will protect us? Do we have any reason to believe that this works? Since at least the mid-70's, we've been subject to airport security because of a series of previous airline hijackings. That security was a pain but we all put up with it because we thought it was worthwhile, while at the same time probably thinking it was all a bit of a joke. Did all those years of X-raying and metal-detection stop any hijackers? It's difficult to know for sure. It certainly didn't stop the 9/11 suicide hijackers. The question remains though, why are photographers considered to be threats that need to be controlled? What are we doing that is so dangerous? Ok everybody. Go take pictures in airports so it won't be considered "suspicious activity". If many people do a "suspicious activity", it will be considered "normal" after some time. Using common sense (Alas! A rare commodity today!) will keep the gestapo, err, authorities at bay. When we picked up our absolutely favorite Chinese import (our now 2-year old grandson, Matthew) at Hartsfield Airport in August last year I knew I wanted to thoroughly document the occasion with my camera, so I went 2 hours early, sought out both the TSA officials near the gates where we met our children and new grandson and ALSO the local Atlanta police station at the airport and cleared it with the shift commanders of both groups. They were courteous and almost as excited as we were and I respected their requests not to photograph in certain areas and made SURE to be very highly visible and obvious where and when I was shooting. I even got THEM into a couple of shots and shared some of the photos with them afterwards. I sent some 4 x 6 copies to the individuals who gave permission and now have "friends in higher places." My former next-door neighbor was a retired Chicago cop. He was probably at the 1968 convention. Nice guy, but a hardass (and kind of wild--when his kids took his car away at age 82 because of his erratic driving, he found it, hot-wired it, and drove it home). Big guy, former prize fighter, and strong as an ox even as an old man. Anyway something he said once sticks in my mind. He said he'd never be a policeman now. "In my day, people did what we told 'em. Now, people don't know how to act." FWIW. This article ties in nicely with the British Home Secretary's recent announcement to allow local police to restrict photography at their discretion (http://www.bjp-online.com/public/showPage.html?page=801977). How sad. 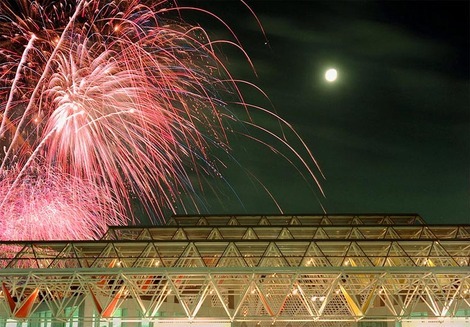 On a side note, the pavilion pictured in the accompanying fireworks image was finally pulled down this summer, 22 years after being erected as a temporary structure for Expo '86. There are discussions that the Vancouver Art Gallery may move into the site following the 2010 Olympics. You know, I can sort of see what your ex-neighbour retired cop was getting at. There are times when you wish people would just shut up and do what you tell them. I volunteer at car rallies and have worked crowd control. Out in the bush, where rallies happen, logging roads can be narrow so it's important that spectator vehicles be parked well off the road to let possible emergency vehicles through. When you have to explain that for the 150th time to yet another spoiled brat who thinks he owns the road, you end up frustrated. When an officer is trying to clear an area or keep an area clear for perfectly good reasons, it must be a trial to put up with people who think the rest of the world was created for their private amusement. But even given all that, it still doesn't explain why the act of photography seems to be singled out for attention more and more. This may or may not be completely off-topic, but I suppose that when you shoot for the NYT it's easier to get releases and co-operation. There's a marvelous piece of photojournalism in the Times today, cross-sectioning a train ride. Very well done - and in public, on a train, with 128 strangers. A timely post, as I was questioned by a *flight attendant* yesterday, who wanted to know (and from the tone of her voice, it was not idle curiosity) what I was photographing out the window (the plane parked at the next gate). I told her that, and asked if that was a problem. She backed off, and the whole encounter was civil, but it was a bit jarring. I've encountered employees at Heathrow (which is quite security-conscious) who not only didn't object to my photographing planes on the ramp, they even suggested a couple of better vantage points. Also remember that these "rules" vary greatly from place to place. In Australia you have no such rights. Malls, bulding and many airports are considered (and actually are) private property and the rules regarding photography are what the owners say they are. When photographing in public I alway carry a copy of the local legislation which I laminate and show to anyone who questions me. It lets them know that I know my rights and I know also what I can't do. If I get any further issues I invite them to call the police. Simple. I recently posted at OPF on a recent experience in London, where I was instructed to delete photographs by 'guards' from the Minstry of Justice. In a timely piece of news, a French photographer from Sipa Press was just arrested Friday in Greece for taking pictures of illegal immigrants in the harbour of Patras. One aspect of this entire discussion that adds to the complexity is that I wonder how often people in authority don't want a record of what they're doing. I don't know the circumstances of that photographer in Greece, but it's difficult not to sometimes be suspicious about motivation. Quite a few times, officers and others have been filmed in compromising situations, and one can't help but think that they are just trying to eliminate damning evidence. That would be a sad thing, of course, but we live in societies where everyone tries to get away with everything all the time, and they often hire good lawyers to help them do just that. Interesting readings. I was wondering who would be approached more often, females or males taking pictures? Would a group taking pictures be less suspicious than individuals? I love to create abstract images of buildings in New York City. However, I have been stopped from photographing the Bank of America office building on Park Avenue by security guards; also at the Citigroup Center at Court Square in Long Island City, Queens, NY. I have been stopped by the military police guarding the US Mission to the UN at 45th St and First Ave. The guard told me it is against the law to photograph any Federal Buildings. I said I was not photographing their building but the UN Plaza office and hotel next to their building. The guard then said it is against the law to photograph buildings next to Federal buildings. So I said if that is true, there must be a lot of tourist felons in Washington, DC taking photographs of the White House, the Lincoln Monument, Congress, etc. But, of course, I stopped photographing. You don't argue with someone carrying a gun. Two months after 9/11, I was composing an abstract photograph of the Citigroup Center on 53rd and Lexington in NY when a stern lady approached me and asked: "Are you making sure that a plane can hit that building?" I shoot mostly digital now, because it is such a hassle to travel with films. An Indian supervisor of security at JFK while doing a hand check of 50 rolls of 220 Velvia film refused to let me go through without cutting open with a pair of scissors every plastic cover of each roll of film. On many European airports, forget about hand checks. I once told a security guy at a Dusseldorf airport to do a hand check and he refused. I protested saying how come in America they do hand checks? He said with a waive of his hands, "Oh, America; forget about America."